Here, four great recipes for restaurant-worthy eggs Benedict. 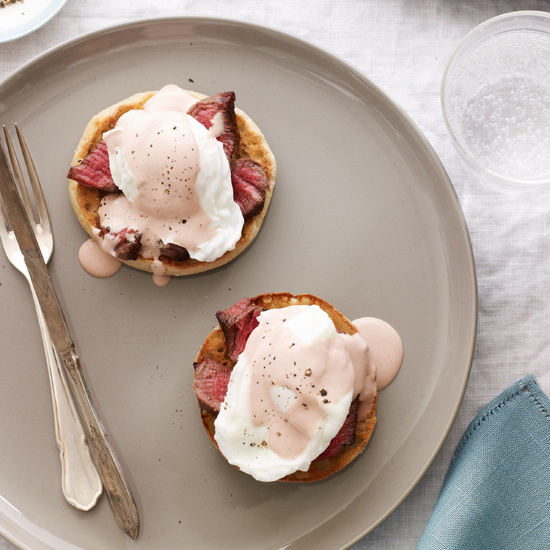 The quintessential brunch dish, eggs Benedict hinges on perfectly poached eggs. To learn how to make them flawlessly, simply watch this week’s edition of Mad Genius Tips in which F&W’s Justin Chapple reveals an easy trick. Then, get ready to earn some major points this Sunday by making restaurant-worthy eggs Benedict for Mother’s Day. Here, four great recipes. In this version of eggs Benedict, rich and crisp applewood-smoked bacon is swapped in for the usual Canadian bacon. This is super-decadent brunch food, but it’s totally acceptable for dinner as well. Classic hollandaise sauce is prepared with butter, egg yolks and lemon juice. Here, we add a red wine-and-port reduction to the rich sauce, which is absolutely delicious with juicy tenderloin. This version of eggs Florentine is based on eggs Benedict: The perfectly poached eggs rest on toasted English muffins with a bed of garlicky spinach, and are then topped with a light cheese sauce spiked with smoked Spanish paprika.